Do you want to live with intention? Learn how to enjoy the blessings of intentional living by considering two key elements of living intentionally. 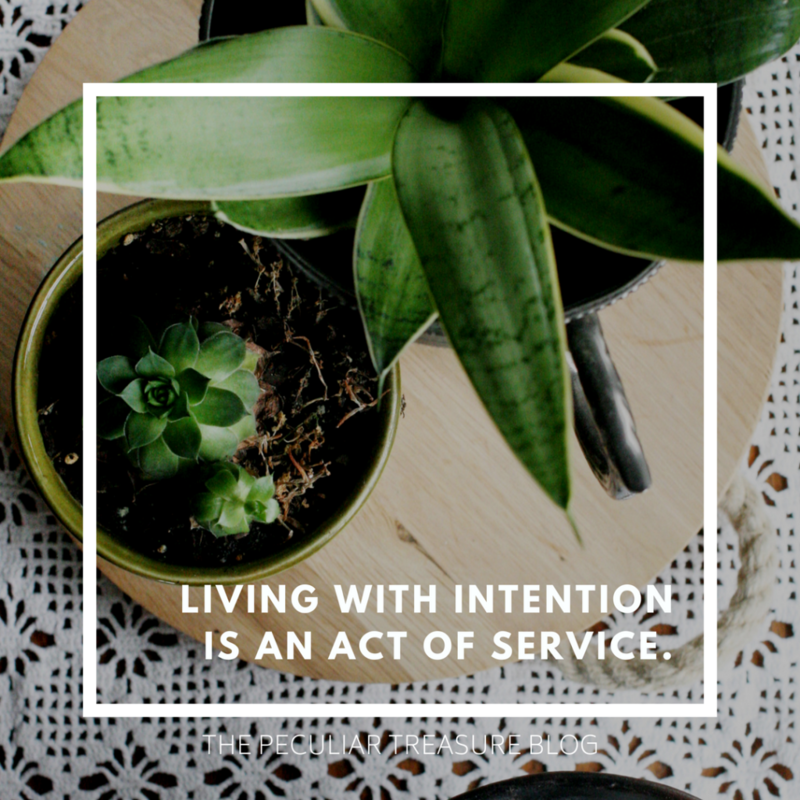 Skip perfection, choose service, and start living with intention, today. 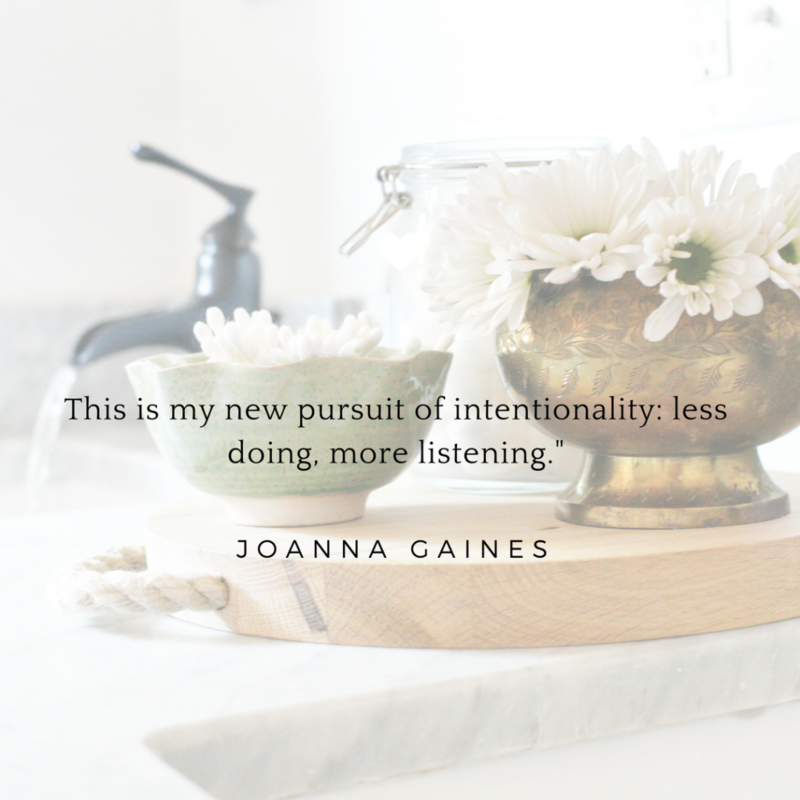 Have you ever thought about the true definition of intentionality? Sure, it’s a buzz-word these days, but what does it really mean to be intentional? What does it look like and how do we live an intentional life when we are worn out and craving some time to unwind? I’m Kristin of The Peculiar Treasure Blog, a Faith and Lifestyle blogger, with a passion for helping women understand their worth, their capabilities to live well, and their responsibility to live out their calling. I am particularly passionate about growing in God, rejecting the temptation to settle for less than the best, and learning how to be faithful in the little things. How do we live with intention? 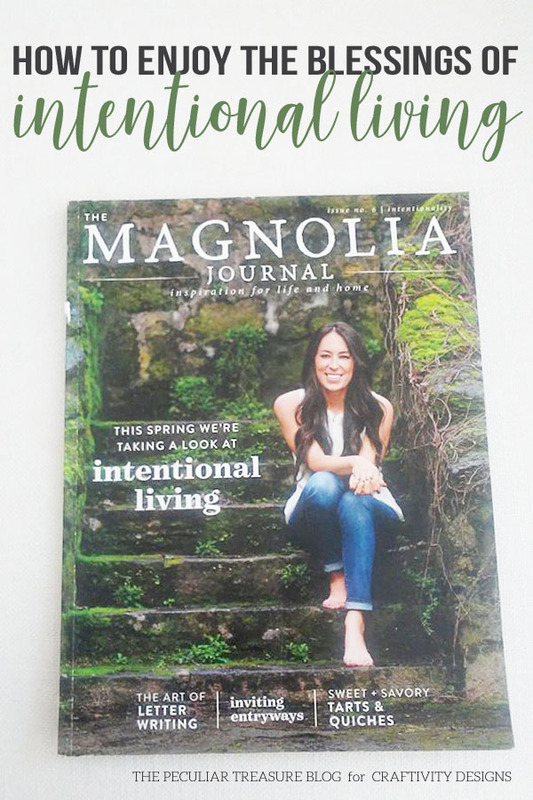 Joanna Gaines addressed this matter in the Spring (2018) issue of The Magnolia Journal, and as always, she had wise words to share. Joanna has this way about her, and she almost always makes me feel challenged to do better in life, while still feeling like I am being showered with love and grace. So naturally, after reading this article, I found myself inspired to learn how to live my life intentionally, and how to listen to others and slow down enough to hear what they need from me. 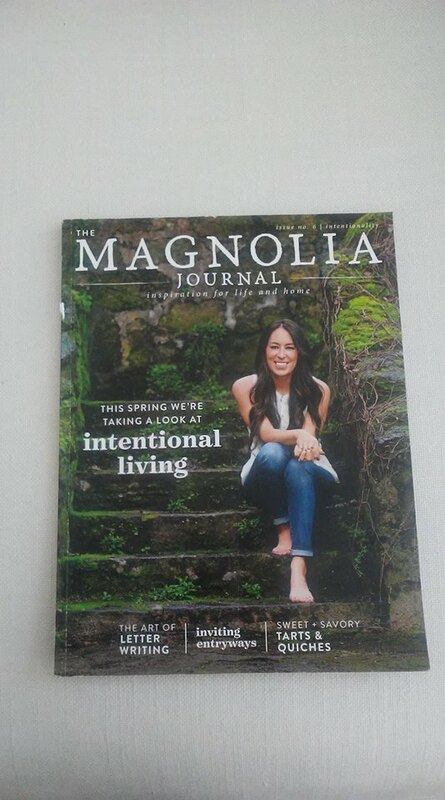 Curious to know what lessons I learned from Joanna Gaines? Keep reading to find out. The first thing I learned was that being intentional is far more important than perfection. Everyone tends to focus on outward appearances– how clean the house is, how many courses we plan to serve our dinner guests, or how perfectly we accomplished our newest project. But if we look closely, I think we will find that the people around us want our presence and our time, not our accomplishments or bent towards perfection. Consequently, we will also find that if we pay attention to the meaningful moments that are in front of us right now, our hearts will be full. However, if we are too busy trying to create the “perfect moments,” we will find ourselves stressed and missing out on what matters. Joanna used an example from her own family to illustrate this point. She said that lately, she and her family have been gathering around the dinner table at night and not only eating but really talking together and cherishing their time. She said that it’s not really as important what she cooks or how it looks, it’s about the time they spend together. At the end of the day, our kids don’t care if our meals look magazine-cover-worthy. Our husband’s don’t care if our chicken pot pie is better than everyone else’s. They don’t care if the house isn’t spotless, and they don’t care that we didn’t check off every item from our to-do list. But what they do care about is the time we give to them. They care that we hear them, love them and are willing to carve out intentional moments with them. If we really listen, it will eventually become evident what our family and friends need in this season, and we can choose to be intentional in giving that to them, whether it will be perfect or not. Take time to think through people’s love-languages, and pay attention to what people need right now, in this current season. This will take effort on our part. We must be willing to listen well, and put what we hear into action by serving our family and friends. What is it that makes our loved ones feel important and cherished? How can we better love our spouses, parents, siblings, and grandparents? How can we best shower affection on our friends and neighbors? The answers to these questions will help us be more intentional in our day-to-day activities. You may enjoy your after-dinner Netflix binge, but if being intentional means you help your husband in his weight-loss journey by skipping the couch and opting for a walk around the neighborhood instead, then that will require sacrifice on your part. 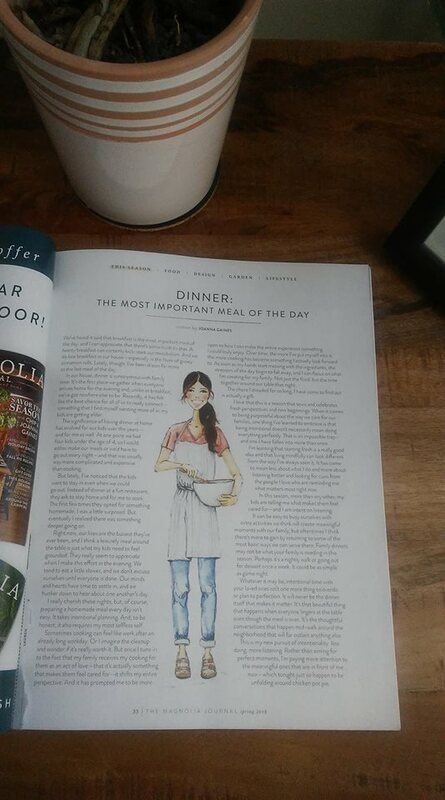 Or maybe you are like Joanna and cooking feels like a chore, but you know your family cherishes the dinners you all share around the table. It won’t be easy at first, and you’ll have to get creative, but surrendering yourself to the task at hand (i.e. preparing a meal for the family) can bring great joy through embracing a mindset of intentional living. You may even end up loving it. Joanna did! Whatever it is that requires your attention in this current season of life, choose to be intentional with it. It may be tough and it may require selflessness on your part, but living intentionally is a blessing. Living intentionally reaps little fruits that are worth the effort. Living intentionally might be just what we need. Kristin lives with her husband and three dog-daughters in South Georgia, where she spends her days drinking copious amounts of coffee, getting puppy snuggles, and blogging at The Peculiar Treasure. She has a passion for helping women improve the way they live their lives through the grace of God, and she writes to both encourage and challenge her readers towards Christ. Kristin believes we should learn to use our spiritual gifts well, and reject entitlement in order to live the lives we were made to live. Beautifully written! I really resonated with “I think we will find that the people around us want our presence and our time, not our accomplishments or bent towards perfection.” Thanks for these words! Yes! This spoke to me when I first read Joanna’s article too. I am very much a person who tries to earn people’s love by doing, instead of just enjoying time with them and being confident that they love me. Joanna hit the nail on the head. I enjoy reading Joanna Gaines new magazine. It isn’t about what you have done and give me a pat on the back. What are you doing for others. Yes! The Magnolia Journal is a breath of fresh air, especially compared to all the magazines out there that are laced with never-ending adds. When I read TMJ, I feel like I am actually cared about, versus just being sold to. This is such a beautifully written post, and it’s somehing I have had on my heart for the last few weeks. Intentional living is a concept I have been striving for and have been incorporating in my life as well. And I completely agree with your statement about intentionality being an act of service. This is something I haven’t thought about when practicing and thinking about this lifestyle and mindset. Yes! Intentionality is so important and it is something that we really have to be conscious of each day so that we actually walk in it. I’ve always like Johanna Gaines, but I used to wonder how she did it all. I’m glad that she’s taking more time for herself and family. The best time is the time spent with someone you love. I 100% agree, Beth. I always wondered the same thing, and worried that it would cause her/them problems if they didn’t slow down. I’m glad to see the same. I love the idea that living intentionally is an act of service. I know that when I have a heart of service, I am much happier. I haven’t been living intentionally lately, and I can feel the stress. Thanks for this wonderful article. I’m so glad it encouraged you, Mary! I can very much relate! This is such a great post! I love the suggestion of focusing on peoples love languages. Time moves so quickly, it is so important to slow down. Absolutely! It’s “easier” to be busy and bustle around all the time, but it’s far more important to slow down and be intentional. I love that — live with intention, not for perfection. LOVED this post! Thank you, Lily! I appreciate it! Thank you for reading! Less doing, more listening. I love that! It’s so true! I feel most cared for by people when we just spend time together and talk. I agree, Crystal! It’s nice to be served, but a lot of the time, I just want the quality time. Joanna is such an inspiration! Thank you for sharing and reminding me to live intentionally. So important as the school year kicks back into gear! She really is! And thanks, Bailey! I am glad you enjoyed it! being present and intentional is a goal i try to reach daily! this was a good read!